Enviroshake Inc. has launched a new product called Enviroshingle®. Enviroshingle® is designed to emulate a 5” perfection cedar shingle and is available in two different profiles and three different colours to offer an authentic cedar shingle look. Enviroshingle® provides the look of cedar, with lifetime performance. Enviroshake® Inc. is pleased to announce the launch of the Enviroshingle® roofing product. The Enviroshingle® offers a natural and tailored appearance, and is designed to emulate a smooth sawn architecturally uniform perfection cedar shingle. Just like Enviroshake® Inc’s original Enviroshake® product, the Enviroshingle® is a composite roof shingle made from 95% post-industrial recycled material. Enviroshingle® is designed to authentically replicate the look of a natural perfection cedar shingle. Enviroshingle® is the perfect solution for those who want the look of cedar without the hassle. The proprietary formulation and manufacturing process results in a product that is has enhanced durability, longevity, and performance. Enviroshake® Inc. products are not susceptible to mold, mildew, fungus, rot or insect infestation. They are also hail resistant and can withstand severe weather conditions and temperature fluctuations and extremes. The Enviroshingle® can even withstand wind speeds up to 180 MPH, or level 5 hurricane strength winds. The Enviroshingle® can be installed efficiently with less waste than traditional cedar, does not require any pretreatment, and once installed is maintenance free. There are no added expenses for preservatives or coatings that are recommended with wood and other products. The Enviroshingle® will retain its physical properties and look for decades, and is even sold with a lifetime warranty that is and fully transferable within the first 50 years for residential projects, and a 50 year warranty for commercial projects. Enviroshingle® is available in two profiles (All bundles are pre-shuffled to include a mixture of both profiles). Every shingle is 12” long and 20” wide with a thickness of X. Each shingle weighs approximately 2 lbs. Enviroshingle® is installed at a 5” exposure, and can be installed on roof slopes 4:12 and greater. Enviroshingle® can also be used to accent other exterior areas of your home. All ridge caps are custom made for each project (available in 3/12 through 16/12 pitch, and come in bundles of 10). Enviroshake® Inc. is pleased to offer various colour options to emulate a natural cedar roof. Enviroshingle® is available in classic silvered cedar, aged cedar, or multi- tone, which is a combination of silvered and aged cedar coloured shakes. All Enviroshake® Inc. products will weather, and as with cedar, there will be slight variations in shading and thickness of the shakes, giving the product a natural look on the roof. The Enviroshingle® offers significant labour savings compared to cedar perfection shingles. Due to Enviroshingle®’s design, it can be installed with 4x less labour than perfection shingles, as cedar shingles require 4x the pieces, and 2x the nails. On a 4000 square foot roof, you would be installing16,800 less pieces and would use 22,400 less nails by using Enviroshingle® vs. perfection cedar shingles. 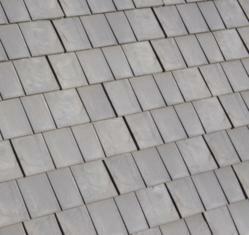 “We’ve launched the new Enviroshingle as a response to a growing demand from our customers for a 5” cedar shingle look. The Enviroshingle® is designed to be installed at a 5” reveal offering a look that is perfectly suited for your roofing needs, as well as other accent areas on the exterior of your home.“ says Ashley Hewko, director of marketing for Enviroshake Inc.
Enviroshake® Inc. is the sole manufacturer of the Enviroshake® and Enviroshingle® roofing products. Enviroshake® Inc. has been in business since 1998 making us a pioneer in the composite roofing industry. No other composite or synthetic product on the market today, can rival the combination of Enviroshake®’s authentic look, durability, performance, and longevity. Enviroshake® Inc. is ISO-9001-2008 certified, and have been operating under this certification for over 10 years. Enviroshake® Inc. prides itself on engaging in best practices, and we are always striving to minimize our environmental footstep. Enviroshake® Inc. is proud that its operation fulfills all the components of the 3R environmental agenda – reduce, reuse and recycle. For additional information call 1-866-423-3302 or visit http://www.enviroshake.com.